I recently visited Mamma at her urban farmlette in Connecticut, a .02 acre garden and orchard teaming with vegetables, apples, pears, peaches and two beehives to pollinate the whole lot. All of this sits within a hundred yards of Long Island Sound, making for an intoxicating perfume of sea spray and tree-ripened fruit. There is no way I would ever miss harvest season at home. It’s spectacular. On this occasion, Mamma was excited to tell me about the new neighbors, a young, entrepreneurial Italian couple who imports two Italian specialties: handmade furniture and Parmigiano-Reggiano cheese. You might be thinking, parm!? How could two people subsist on parm and tables. But friends, they do not import the kind of Parmesan we buy shredded in tupperware or douse on our pizza in dust-like form. 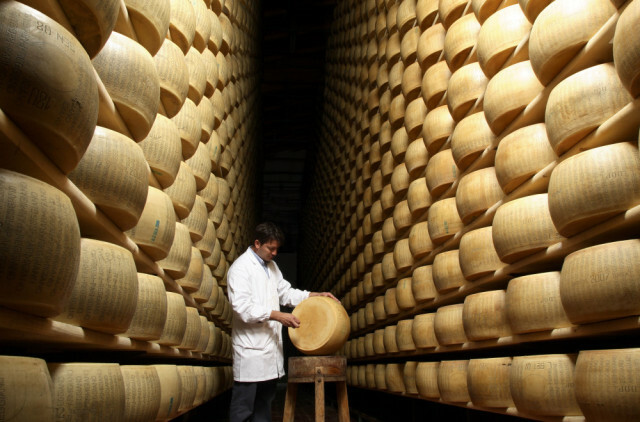 This is true Parmigiano-Reggiano, the kind that transports you to the cheese caves of Medina and Italy’s other famed cheese hubs. It is an 800-year old tradition still prized in the modern century. 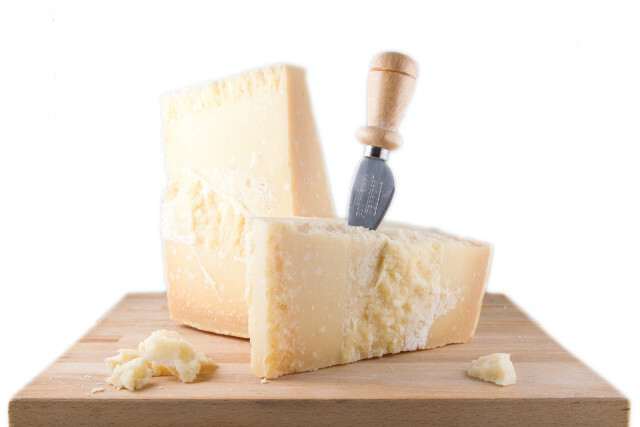 Growing up, there was always a wedge of Parmigiano-Reggiano in the refrigerator, it’s rounded crust bearing the trace of the mammoth wheel it was carved from. Mamma always said that if you had pasta, garlic, olive oil and Parmigiano-Reggiano in the kitchen, then you had a meal. But it was also a quick snack, packed with protein, amino acids and low in fat and cholesterol. It’s one of those cheeses that even lactose intolerant eaters can stomach. It’s a “hard” cheese, yet it has a supple, crumbly texture riddled with cheese crystals. It is nutty, rich and intense, but not off-putting (as blue cheese is to some). It is perfectly universal. There is a specific way of cutting Parmigiano-Reggiano, which no one in my household seems to ever uphold. Mamma often let’s out an exasperated sigh as she asks again “who cut the cheese last!” You do not slice Parmigiano-Reggiano with a knife. Remember this when you visit Italy or an Italian household: you do not want to incur a Mamma’s wrath. Instead, you would use a knife more like a pick, and chip away nuggets of cheese from the open face. Got it? Ok good. I had pocketed the neighbor’s brochure about their cheese, after chipping my way through the wedge in Mamma’s fridge for days. Something about the “Minted Poached Pears with Parmigiano-Reggiano” recipe had me intrigued, and I knew I would find an opportunity to make it. It came sooner than expected, with Rosh Hashanah. I’m half-Jewish, from my father’s side, and over the years have become increasingly interested in Jewish holidays and food traditions. Growing up we never celebrated them with dedication, always more interested in the food than the prayers. I can’t say much has changed, but I’m at least making a more concerted effort to celebrate with food and friends while learning about the holidays’ history. So when our dear pals, The Ashes, invited us to Rosh Hashanah dinner last week, I seized the opportunity to make this recipe … of course, with a Frisch Twist. Pomegranate is a food often served around Rosh Hashanah. It’s seemingly endless quantity of ruby jeweled seeds symbolize the fruitfulness of a new year. And so, in went pomegranate juice to replace some of the red wine, with a few other minor changes to an already fabulous recipe. I overcooked the pomegranate syrup on the first go, but on the second go at home it was light and delightful. The savory Parmigiano-Reggiano added a flavor pop that was wholly exciting. Even the kids liked it! Autumn is the optimal time of year to make this dish, when pears are tree-ripened but still firm to the touch. 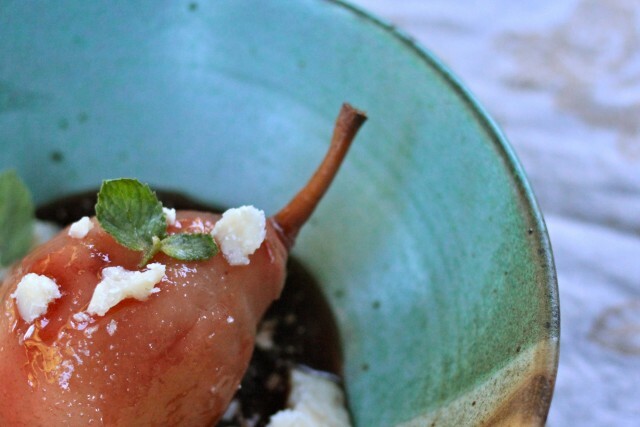 A mushy pear won't stand up as proudly to the heat of the pomegranate poaching liquid. Cut the lemon peel away from the lemon, removing only the yellow skin and leaving behind the bitter white pith. Juice the remaining lemon. Peel the pears (leaving stems attached) and toss with the lemon juice in a large bowl to prevent from discoloring. In a large saucepan, combine the water, pomegranate juice, red wine and honey. Bring to a boil and mix together. Reduce to a simmer. Add the lemon peel to the juice mixture, and half the mint leaves. Add the peeled pears to the pomegranate mixture and continue to simmer for 15-30 minutes, until a toothpick is easily inserted and the flesh is tender. Turn the pears occasionally. Transfer the pears from the poaching liquid to a fresh bowl or plate. Continue simmering the pomegranate liquid for 15-20 minutes, until it reduces enough to lightly coat a spoon with sticky syrup (do not reduce to candy, like I did the first time!). 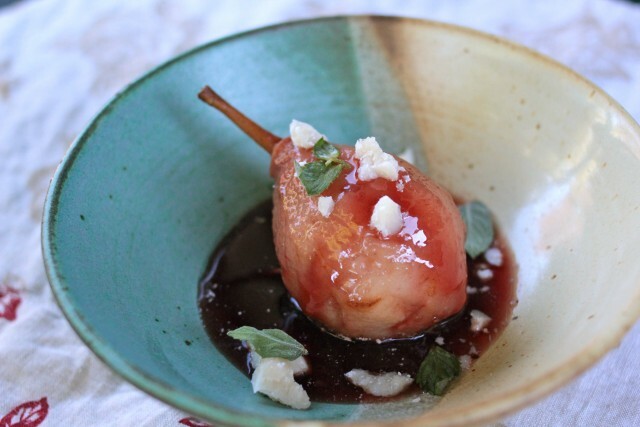 To serve, add a pear to each bowl and spoon pomegranate syrup over the pear. Garnish with mint leaves and Parmigiano-Reggiano nuggets over and around the pear.